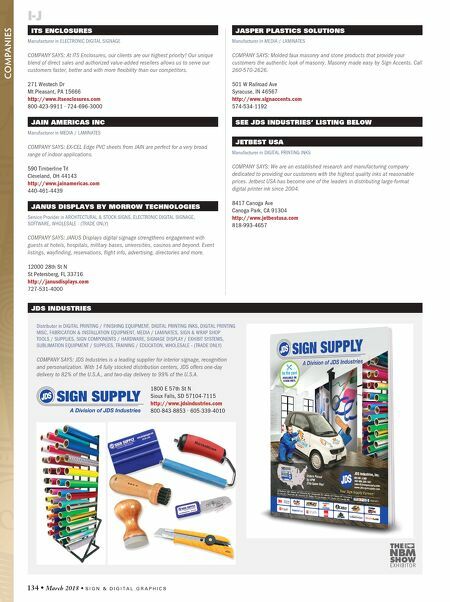 S I G N & D I G I T A L G R A P H I C S • March 2018 • 135 JOSEPH STRUHL CO INC Distributor in SIGN COMPONENTS / HARDWARE, SIGNAGE DISPLAY / EXHIBIT SYSTEMS COMPANY SAYS: Joseph Struhl Company, Inc., is a multi-generational family business that has been supplying the sign industry since 1948 with its innovative MAGIC MASTER sign and display products. 195 Atlantic Ave PO Box N Garden City Park, NY 11040 http://www.magicmaster.com 800-552-0023 ∙ 516-741-3660 JPS INC Manufacturer in WHOLESALE - (TRADE ONLY) COMPANY SAYS: JPS Inc. is a wholesale sign manufacturer of quality workmanship, superior materials, and easy to install carved and sandblasted signs. 5890 Lexington Rd Girard, PA 16417 http://www.jpsigns.com 888-744-6999 ∙ 814-774-1040 JHM SIGNS Manufacturer in ARCHITECTURAL & STOCK SIGNS, AWNING SYSTEMS / SUPPLIES / EXTRUSIONS, ELECTRONIC SIGNAGE (LED / NEON), WHOLESALE - (TRADE ONLY) COMPANY SAYS: JHM Signs proudly creates signs, banners and vehicle graphics for local small businesses, organizations and teams, growing businesses and Fortune 500 companies alike. We are the leading sign company in northwestern New Jersey. 1593 Springtown Rd Alpha, NJ 08865 http://www.jhmsigns.com 908-859-6668 JOHN'S STUDIO Manufacturer in WHOLESALE - (TRADE ONLY) COMPANY SAYS: Why John's Studio Wholesale? Our quality products and fast, friendly service make us the preferred trade supplier! 56 Harvester Ave Batavia, NY 14020 http://johnsstudiowholesale.com 800-433-5545 ∙ 585-344-3815 SEE JOHNSON PLASTICS PLUS' LISTING BELOW J JOHNSON PLASTICS PLUS Distributor in FABRICATION & INSTALLATION EQUIPMENT, MEDIA / LAMINATES, SIGN & WRAP SHOP TOOLS / SUPPLIES, SIGN COMPONENTS / HARDWARE, SUBLIMATION EQUIPMENT / SUPPLIES COMPANY SAYS: Johnson Plastics Plus...everything you need, all in one place: sublimation, heat transfer, UV-LED printing or engraving. Regardless of your process, we've got the materials you need, in-stock and ready to ship. 9240 Grand Ave S Minneapolis, MN 55420 http://www.jpplus.com 800-869-7800 ∙ 952-888-9507 COMPANY PROFILE: The Johnson family built its business, originally named Johnson Plastics, on the belief that a strong customer focus is as important to the business as the products that are sold. 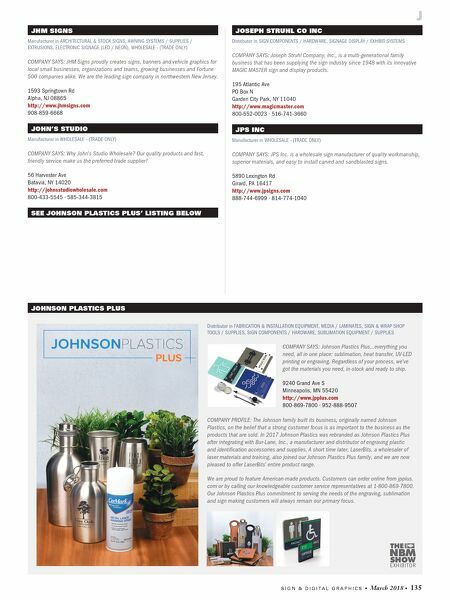 In 2017 Johnson Plastics was rebranded as Johnson Plastics Plus after integrating with Bur-Lane, Inc., a manufacturer and distributor of engraving plastic and identification accessories and supplies. A short time later, LaserBits, a wholesaler of laser materials and training, also joined our Johnson Plastics Plus family, and we are now pleased to offer LaserBits' entire product range. We are proud to feature American-made products. Customers can order online from jpplus. com or by calling our knowledgeable customer service representatives at 1-800-869-7800. Our Johnson Plastics Plus commitment to serving the needs of the engraving, sublimation and sign making customers will always remain our primary focus.